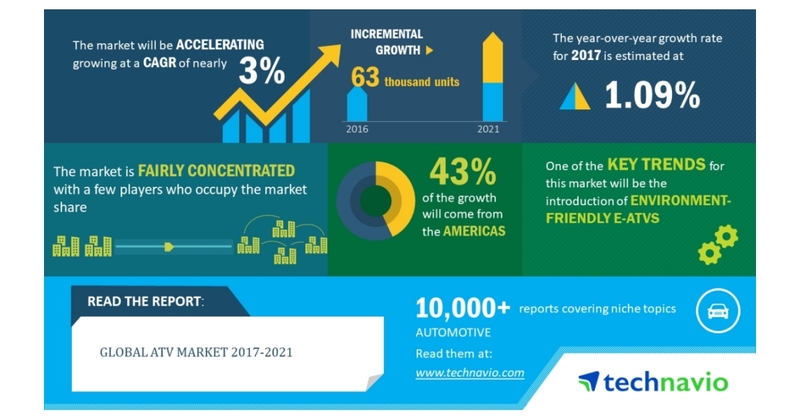 LONDON–(BUSINESS WIRE)–According to the latest market research report released by Technavio, the global ATV market is expected to accelerate at a CAGR of nearly 3% during the forecast period. The lower maintenance cost of e-ATVs is one of the key factors triggering the growth of the market. This research report titled ‘Global ATV Market 2017-2021’ provides an in-depth analysis of the market in terms of revenue and emerging market trends. It also includes an up-to-date analysis and forecasts for various market segments and all geographical regions. In 2016, the utility ATVs segment accounted for nearly 57% of the global market and is projected to decrease by 2021. Environment-friendly e-ATVs is an emerging trend in the ATV space. Countries around the world are coming up with stringent emission norms to curb the levels of GHG emissions from vehicles, thereby controlling environmental pollution and global warming. The development and adoption of electric vehicles are the major solutions to reduce GHG levels in the atmosphere to an acceptable level. Such movement toward EVs, have pushed the ATV manufacturers to come up with e-ATVs as an alternative to the environmental issues. These ATVs use electric powertrain, which helps to reduce environmental pollution and excessive vehicle noise. ATV manufacturers are also coming up with hybrid ATVs, which can run on combined electric power and engine.